An account and critique of the Chinese Cultural Revolution, which portrays the "revolution" as a factional squabble within the Communist Party bureaucracy which enabled the working class to begin to assert themselves as an independent force for a time before being crushed by the state. The Great Proletarian Cultural Revolution is claimed by many Maoists as the highest point of communism in the history of mankind. Maoists such as the RCP and Kasama and even more anarchist leftists like Michael Albert see the event as evidence of the liberatory potential of Maoist thought. The New Left in general was enamored by the events in China and radical newspapers from the era are full of Mao portraits and quotes from the Little Red Book. “It is right to rebel” being taken up as a slogan made the Maoists seem like they were more anarchist than the anarchists, the “hardest” of the revolutionaries. 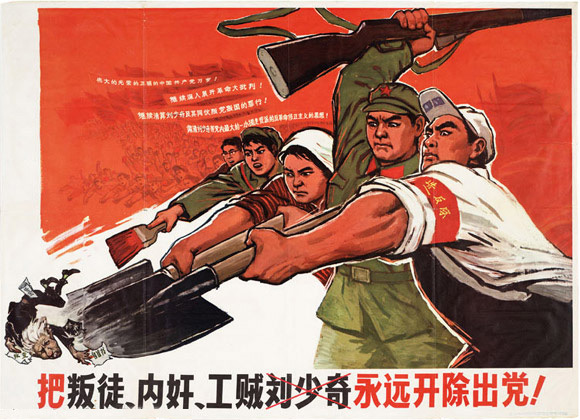 If anything, the Cultural Revolution exposes the poverty of Maoist politics. Maoism only promised “the right to rebel” to the extent that rebellion stayed within the confines of Maoism. To call what happened during the years considered the height of the GPCR (66-69) a revolution, nonetheless a proletarian one, is certainly a misnomer. A more apt description would be that it was a bureaucratic power struggle that in many cases got out of hand. Gaps in authority were certainly created by Mao’s chaotic tactics of consolidating power and workers certainly took advantage of these gaps in authority. But in the end Mao’s Cultural Revolution wasn’t much different from Stalin’s – an attempt to solve the problems of socialism-in-one-country through purging the state leadership of corrupt “capitalist roaders” rather than changing the social relations that led these corrupt positions to develop. The very concept of Cultural Revolution is foreign to Marx’s conception of revolution. Marx viewed proletarian revolution as a process that is not merely political but social. There is no separate category of Cultural Revolution differentiated from the revolution which transforms the totality of social relations. Marxist-Leninist dogmatism claims that the expropriation of the bourgeoisie, nationalization of property and establishment of central planning under the rule of party eliminates the basis of class antagonisms. Yet it was clear that China in 1966 was no workers utopia that had ridden itself of all social contradiction. In Mao’s eyes the remaining contradictions of society were contained strictly within the political/cultural superstructure, for the economic base no longer contained class antagonism. Maoist theory claimed that the superstructure was “relatively autonomous” from the base and hence a “cultural revolution” was needed to purge the revisionist leadership within the CCP. This was not a Marxist theory of revolution, but rather a populist theory that was not dissimilar from Bismark’s Kulturkamf. In no way was the GPCR a spontaneous event. After the enormous human toll of Mao’s failed policies in the Great Leap Forward much of the CCP took a more conservative stance on economic issues. Voluntaristic and extremist policies were avoided and Mao was reduced to a more symbolic “father of the country” style figure in the party, though his theories were still official state doctrine. Like the ruling bureaucracy of all the classic Stalinist nations we can see two general factions in the CCP – those like Mao who wanted to maintain autarky and a command economy, and those like Deng Xiaopeng who favored the continued existence of internal markets and gradual development. Mao had been looking for ways to purge the party of the more rightist faction years before the Cultural Revolution using internal party channels but there efforts were to no avail. Such a task would require mobilizing the masses outside the party, who had no shortage of reasons to gripe about the disconnect and corruption of the state bureaucracy. Yet it was not from the masses where the GPCR would have its origin, but from within the CCP with the founding of the Central Cultural Revolutionary Group. This group only had a limited influence with the party as it was composed of Mao and his closest cohorts. By going outside of the party and channeling mass discontent Mao’s faction concocted a strategy to not only consolidate power but to further refine his ideological hold over the nation. At first the Cultural Revolution was very similar to earlier anti-rightist campaigns that aimed to persecute former bourgeoisie. Many students engaged in criticisms of professors they viewed as overly traditional and conservative. Head of state Liu Shaoqi’s very much tried to keep the movement within these bounds, avoiding criticism of the party members themselves. It was in May 1966 when Mao suggested that rightism was a trend within the party itself, that party committees at all levels should be subject to criticism. It was in the summer of 1966 when the Red Guards formed. These groups of youth were united by an ideological adherence to Mao-Zedong Thought and their legitimate grievances with the CCP. Many Red Guards were the children of state bureaucrats who saw themselves as the “cream of the crop” of China, while others came from more “lumpen” backgrounds. While the Red Guards were divided into many factions, some of them gang-like, one can make a general divide between the more revolutionary and conservative Red Guards, the more revolutionary typically from less privileged strata of society. Some factions of Red Guards found themselves attacking party committees for rightism, while other Red Guards found themselves defending party committees from supposed rightists! Eventually the movement fell out of Liu Shaoqi’s control and Mao had many of the more conservative factions of the Red Guards banned. As the movement grew social turmoil intensified and Red Guards began to to even carry more power than Party committees in some areas. Bureaucrats who were used to being unhindered lording over society were now being socially persecuted in public struggle sessions, some which were so intense that suicide was the final result. Mao was giving the masses a chance to express themselves while still ultimately maintaining the structure of the party-state. In Shanghai, December 1966 the movement spread beyond the criticism of bureaucrats into a mass strike of apprentices who were asking for better pay and working conditions. A movement that originated in the party to mobilize students and lumpen was now impacting the disaffected proletarians of China, with order in Shanghai now withering away. Now that workers were engaged in struggle their demands were simply regarded as economistic for merely being wage demands. The ideological propaganda coming from Mao and cohorts now focused on attacking the “economism” of workers who were refusing to restore order. Red Guards were ordered “to take power” in Shanghai, but this was not a move to transcend the party-state but rather one aimed to quell the dissent of the working class. Millions of Chinese workers were temporary contract workers from the countryside that were denied the benefits that full time workers received, finding themselves in an economically un-stabile position. While the demands of workers revolved around issues of egalitarianism and were essentially socialist in content they were dismissed by Mao as “rightist”. In fact, these workers were merely agents of rightist bureaucrats who were trying to restore “revisionism” to power! Mao’s orders for the Red Guards to “take power” in Shanghai was certainly a move that had more to do with consolidating authority and getting the workers to shut up than with establishing any kind of dictatorship of the proletariat. From attacking party bureaucracy in general to denouncing the “economism” of workers , Mao’s propaganda then went to urging Red Guards to “unite with all who can be united”. What this meant was making peace with the majority of party bureaucrats, for now it was just a handful of bad apples that needed to be worried about. “Narrowing the focus of attack” meant that criticism was now concentrated on Deng Xiaopeng and Liu Shaoqi and often went to absurd lengths. Any shared political positions that Mao and Liu had the past were denied, for all positions that Liu held were inherently rightist. Focusing the political energy of the movement on attacks against Liu and Deng rather than a critique of society itself helped Mao further restore order and bring the Red Guards closer ideological control of his faction of party-state. The real intentions of the movement became clearer when Deng and Liu were no longer influential in the CCP and Mao ordered an end to free transportation for Red Guards throughout the country. With the emergence of “ultra-left” currents that saw the need for actual revolutionary change Mao seemed to lose interest in the mass movements that had developed. The next step was to call in the army. Lin Biao, the commander in chief of the People’s Liberation Army, had done much to indoctrinate his troops with the ideology of Mao-Zedong Thought. Lin was an ideologically dedicated Maoist, one of the bureaucrats most sympathetic to the extremist policies of the Great Leap Forward. He was also a key figure in crafting the Mao Cult as it existed during the Cultural Revolution by compiling what is known as the Little Red Book, a compilation of quotes by Chairman Mao that served as ideological poetry for the Red Guards. Though Lin Biao would later be accused of plotting a coup against Mao his allegiance to Mao meant that the PLA could be used to establish state authority amongst the political chaos that had taken over the country. In February of 67 New state organs called revolutionary committees, or three-in-one committees were ordered to be established throughout the country, containing 1) representatives from the army, 2) representatives of Red Guards and 3) old party bureaucrats. Essentially the masses were now being called on to ally with the party bureaucrats they had so eagerly criticized and mobilized against when given the chance. As one can imagine the establishment of the revolutionary committees was met with mass opposition and it took a while for the state to fully establish authority. Mass demonstrations and strikes had to be put down violently in many cities. In Shanghai the revolutionary committees had to assure ascendance through the democratic mystifications of the “Shanghai People’s Commune”. The elections never even happened, for the Shanghai People’s Commune lasted less than a month and was merely a way to transition into the rule of the three-in-one revolutionary committees. After Deng Xiaopeng and Liu Shaoqui were no longer ideologically an influence in the CCP much propaganda from the Maoist Center focused on demonizing the growing “ultra-left” that took Mao’s call to rebel seriously. Any ruling group will never be able to fully establish the complete hegemony of its ideology and the Maoist bureaucracy was no exception. Army commanders aimed to fully incorporate Red Guards into the 3-in-1 committees but many refused, correcting seeing that these committees were not organs of proletarian dictatorship but class collaboration. This lead to clashes between “ultra-left” Red Guards and the army, complicated by the fact that many soldiers in the PLA were sympathetic to the ultra-left. By end of summer 67 Ultra-left Red Guards were in many cases taking the offensive, with tens of thousands of engaging in an organized siege of government buildings in Beijing for a month. By September Mao and Lin Biao made it clear that they were sympathetic to the army commanders aiming to restore order. Purges occurred and weapons were seized. The more rebellious Red Guards held off for a bit, consolidating themselves and organizing into more effective units. Others opportunistically vied for seats in the three-in-one committees. Many on the ultra-left viewed much of the factional fighting between Red Guards as essentially gang warfare, which it essentially was in many cases. In many cases factional fighting between Red Guards simply amounted to which leaders would occupy seats in the three-in-one committees. Taking a break from the ruthless power politics of before meant a chance to reflect and refine theory. Many currents of thought developed, such “Communist Group” in Bejing, “October Revolution Group” in Shandong, Sheng-wu-lian in Hunan and the more peasant oriented Dei-jue-yang in Wuhan. Whither China is full of references to Marxism-Leninism, revisionism, and Mao-Zedong Thought yet is more theoretically adept in its class analysis than the populist poetry of Mao. Mao merely called for the masses to criticize and perhaps replace the party bureaucrats that managed their exploitation, a program of populist reformism. Whither China called for revolution in permanence, for the continuance of the class struggle. Sheng-wu-lian saw the CCP as a “class of ‘Red’ capitalists” that had “become a decaying class that hindered the progress of history”. The three-in-one committees were merely a “product of bourgeois reformism” that would lead to a dictatorship of the army and bureaucracy if established. Worker struggles dismissed by the Maoist Center as “economistic” were granted support, for Sheng-wu-lian aimed to assert an actual class perspective in its analysis rather than the ideological muck of typical Maoist thought. Calls for the formation of a political party independent of the CCP were made, for it was clear the current state machinery was to smashed rather than reformed from within. What is strange about Whither China is the fact that Mao and Lin Bao are still treated with reverence as heroes. In historical perspective this makes sense – the tropes of Mao Zedong Thought were the only reference points to Marxist theory that were available at the time, so it makes sense that even the most ultra-left groups would be steeped in it. Ultra-lefts in the GPCR used the sayings of the “great teachers” in ways that were never intended. While these currents believed themselves to be accurately following the tenets of Mao-Zedong Thought they were actively working against Mao himself. As a result some explained the obviously counter-revolutionary actions of the Maoist Center as proof that Mao was being taken hostage by rightists. The continued Maoist influence on Sheng-wu-lian was ultimately its greatest weakness. Maoism, being a variant of Stalinism, rigidly holds to the doctrine of “socialism-in-one country”, where national development is prioritized above internationalism. Throughout Whither China one finds no understanding of proletarian revolution as a phenomena that occurs on an international rather than national level. Of course one must keep in mind that during this period China was very isolated from the rest of the world, an autarky by all definitions. There was no contact between the Chinese working class and their comrades throughout the world, making the establishment of solidarity across national borders very difficult. It is easy to imagine that even if ultra-left currents were able to overthrow the CCP and PLA many of the same problems of Chinese society would remain, for China would still have to operate according to the laws of global capitalism. In fact 20 years later Yang Xiguang recognized this, claiming that what Sheng-wu-lian was advocating probably would have amounted to a mere “Dynastic change”. Despite their flaws, the Chinese ultra-left demonstrated that a proletarian class perspective existed in China was willing to express itself through both theory and praxis when possible. One can only imagine how they would have further developed if it weren’t for state repression doing all it could to wipe them out. Despite its proclaimed adherence to Mao, Whither China infuriated the Maoist Center, who proclaimed immediately that it was “counter-revolutionary big hotchpotch” and a “extremely reactionary trend of thought”. Ultra-leftism was viewed by Lin Bao as a force to be crushed, especially in the Hunan province. A major educational seminar set up by the Central Cultural Revolutionary Group early 1968 in Bejing focused much of its time denouncing ultra-leftism and Sheng-Wu-Lian. At this time the three-in-one revolutionary committees were hardly functioning as effective agents of state power in but a couple cities. Working class ferment was at a height with strikes and violent demonstrations spreading from Shanghai to other cities. What began as a purge led by Mao and his cohorts to consolidate influence in the state was spiraling into a movement that now terrified Mao. The solution of course was to unleash a wave of state repression, with the army taking the initiative to crush the ultra-left nationwide. Leaders of Sheng-Wu-Lian were imprisoned or murdered and pockets of resistance were liquidated. Ultimately those who suffered the greatest during the Cultural Revolution were not those who wished to maintain capitalist relations, but those who aimed to transcend them. This wave of repression was coupled with what some Maoists call “one of the greatest attempts to solve the capitalist division of labor.” Millions of students and youth were forced into the countryside to engage in manual labor, greatly dispersing the various political movements that had formed in the past two years. These “rustifcation” campaigns did nothing to actually change relations of production in agriculture but did put many youth to work and out of the streets. The triumph of the revolutionary committees was ultimately the triumph of the PLA and the final establishment of a military dictatorship. The following years of Chinese political history are mostly internal bureaucratic squabbles and very confusing, leading to some very bizarre foreign policy such as being the only “socialist” nation to recognize Pinochet’s Chile. It was ultimately the PLA that won out in the Great Proletarian Cultural Revolution, a vital tool for assuring that working class activity never got out of hand. Multiple 1st world leftist groups obsessed over the Cultural Revolution in the 60′s and early 70′s (see Max Elbaum’s Revolution in the Air), which seemed to coincide with events in Czechoslovakia, Paris and the US student movement. Yet the ideologies of third-worldism and the Mao cult that came to entrance much of the New Left was merely “the explosion point of ideology” to the Situationist International. For the Situationists what was occurring in China was the fracturing of the bureaucratic ruling class, a fracture that allowed the working class to assert itself as revolutionary force for the first time since 1927. Judging from much of the propaganda from the era they seem the exception to the norm, with even Trotskyist from the era sympathetic to Maoism. The student New Left, formerly obsessed with participatory democracy, was now forming rigidly dogmatic anti-revisionist groupings, self appointed vanguards that would form what was known as the New Communist Movement. The mystique that accompanied the Cultural Revolution did indeed make Maoism appear to many as a legitimate alternative to Stalinism and the Soviet Bloc, especially in its anti-bureaucratic rhetoric. Mao’s thought was held up as a less “deterministic” form of Marxism, even a synthesis of Marxism and anarchism. Yet many of these young leftists were unaware that Stalin also called for “Cultural Revolution” and called for attacks on managers and bureaucrats. While Stalin was able to purge political opponents using internal party mechanisms Mao called used the mystique of ideology to call on the masses for his purges. Both Mao and Stalin crushed whatever worker self-activity existed under their regimes and their calls for revolution from above were ultimately useless at addressing the real social antagonisms that existed in their societies. It is important to not only look beyond the mystique of the Great Proletarian Cultural Revolution but to also look deeper into its social content. Both right-wing and left-wing narratives of the event often ignored that those who suffered most in the events were not rightists but rather revolutionary workers and youth who dared to venture beyond the confines of Mao’s power struggle. The militancy of many struggles during the GPCR shows how little the rule of CCP had actually transcended class relations in China, class relations with antagonisms that are still exploding in Chinese society to this day. Taken from http://internationalcommunistconspiracy.wordpress.com/2013/08/22/the-mythology-of-the-great-proletarian-cultural-revolution-and-the-chinese-ultra-left/. First published 22 August 2013.
yeah, it's a really good piece! I should edit my first post. I thought it was dope. Then I got Mao with the sickness.